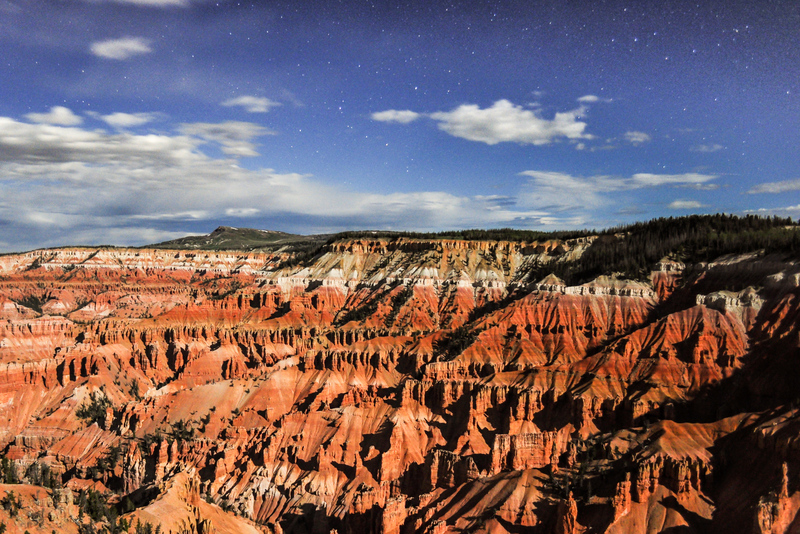 Stars sparkle over the colorful moonlit landscape of Cedar Breaks National Monument. Photo by Zach Schierl. Cedar Breaks National Monument and IDA are excited to announce the designation of Cedar Breaks as an International Dark Sky Park. This distinction recognizes Cedar Breaks as a sanctuary of natural darkness and for the opportunity it provides visitors to enjoy the night sky. Cedar Breaks, about 30 minutes east of Cedar City, Utah, U.S., is far enough from city lights to offer a clear view of the heavens, yet close enough to cities along the I-15 corridor (such as Las Vegas, St. George and Salt Lake City) to give millions of people the opportunity to experience a dark night sky close to home. This combination has made Cedar Breaks a rapidly growing destination for travelers and local residents looking to enjoy a dark night sky. In the summer months, Cedar Breaks hosts popular ranger-led stargazing programs, the highest such programs in the national park system at 3,155 meters (10,350 feet). Cedar Breaks is the 16th of the 417 National Park Service (NPS) units to be designated as an International Dark Sky Park, and the first in southwestern Utah. With this designation, Utah is now home to seven IDA Dark Sky Parks, more than any other state or province in the world. To satisfy the requirements for Dark Sky Park status, Cedar Breaks staff has been working together with numerous community partners, such as Southern Utah University and the Southern Utah Space Foundation, for the past several years. Accomplishments have included installing night sky friendly lighting in the monument, expanding astronomy-related educational opportunities for area residents and visitors, and establishing a robust outreach program that works with local communities to protect dark skies. Cedar Breaks was assisted in this effort by the NPS Natural Sounds & Night Skies Division, NPS Intermountain Regional Office, and the Colorado Plateau Dark Sky Cooperative. Join rangers from Cedar Breaks to celebrate our designation as an International Dark Sky Park! The star party will begin with a short talk about the significance of the designation and a public Q&A period, followed by telescope viewing, night sky stories, and constellation tours. Warm beverages will be provided at Navajo Lodge along with astronomy activities for kids and information on dark-sky friendly lighting.